Scandals, predictions, and insights, oh my! We’ve covered a lot of ground this year in the risk management world. But what were the topics people were buzzing about most? With over 50 blogs posted in 2018 alone, there was a lot to learn and even more you could have missed as the seasons whizzed by. So, we compiled the top ten blog posts of 2018 to help you refresh and catch up! In these ten ERM blogs, we covered everything from the best way to measure the effectiveness of your ERM program, all the way to the corporate mishaps readers keep coming back to. We hope you enjoyed a plentiful year of reading and that next year brings even more learning! If you’re interested in one of these top ten ERM blogs, simply click on its title! If you’re interested in keeping up with us in 2019, subscribe to the LogicManager blog here! Now let’s see what happened over the course of 2018. The most popular LogicManager blog of 2018 had everything to do with budgeting. This blog isn’t just about budgeting for risk management; it’s actually about risk assessing your budgets. Just like new processes, budgets are essentially change documents, and as we all know, change carries risk. We’re happy to see one of our favorite infographics from 2018 made the top ten. CEO Steven Minsky needed a way to sum up the effects social media and online news outlets were having on risk management. He landed on the See-Through Economy since new technology such as this is creating abundant transparency into the business world. The message behind the See-Through Economy isn’t all doom and gloom, however. Yes, consumers have more power than ever to express their negative experiences with a brand, but they also have the same amount of power to spread positive messages about a company. Those who can implement and sustain an effective ERM program are well-equipped to adapt to the See-Through Economy. Click into our See-Through Economy infographic to learn more about this irreversible trend and the steps towards adapting to it! At the close of 2017, we looked back at all the lessons not learned in risk management (i.e. the abundance of corporate scandals) and wondered what 2018 would bring to ERM. LogicManager CEO Steven Minsky coined the phrase the See-Through Economy to encapsulate the changes new technology like social media bring to the business world, and how risk management can help account for those changes. Many subsequent scandals have proven this trend true. Another prediction Steven shared that became widespread was that while federal regulations dip, state regulations would spike. This prediction became especially poignant as consumers became visibly fed up with an onslaught of data breaches and called for increased regulations at the state level to protect their information and privacy. Check out the other two major predictions Steven made that came true in 2018 and think about where you saw them manifest this year. 4. Do Insurance Companies Really Need Risk Management? Insurance became a hot topic over 2018. Risk management has always had a curious relationship with the insurance business, since insurance is in and of itself a mitigation. We published this blog to say that risk management is an integral part of any business, regardless of industry. Insurance industry frameworks like NAIC and A.M. Best place a lot of importance on a robust ERM program to manage underwriting, credit, market, operational, and liquidity risks, to name a few. This blog covers some of the ways risk management can benefit insurers. Ah, Wells Fargo, when will you learn? Hopefully this $1 billion settlement shed some light on the ERM subject. What we see in this settlement is that all the Wells Fargo scandals over the years are intimately related, not one-off incidents. For a long time, Steven Minsky has predicted a connection would be made, on a federal level, between Wells Fargo mishaps and ineffective risk management. This settlement was the proof pudding. As enterprise risk management becomes more and more recognized as a performance asset to businesses, the pressure increases to prove the effectiveness of ERM programs. But how do you measure the effects of bad things NOT happening? You need to collect the right metrics. They need to be quantitative, qualitative, comparable, and centralized. In this blog, we cover four key risk management metrics. 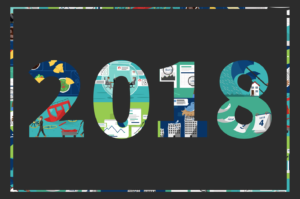 At the start of 2018, we surveyed hundreds of governance, risk, and compliance professionals to understand their biggest challenges and their upcoming goals. We compiled what we found into this infographic. A major theme that turned up in the survey was integrating governance areas. The results of the survey indicate that while the majority of participants have senior leadership that aims to connect risk management across silos within the next two years, less than half think their senior leadership actually understands this integration will prevent risk events. Look out for a new risk management landscape infographic in 2019! The Forrester Wave™: Governance, Risk, and Compliance Platforms, Q1 2018 named LogicManager a Leader in ERM platforms! But aside from this honor, we wanted to take a deeper dive into some of the insights presented in the report. Forrester cited reputation, regulations, and innovation as three major trends emerging in the risk management industry. We took it a step further to say that these trends don’t exist independently. They’re actually all connected to the See-Through Economy, in which innovative technology has empowered consumers to impact a company’s reputation, which in turn encourages regulators to develop new stipulations. The first infographic we put out about the risk management landscape revealed 72% of ERM practitioners cited cybersecurity as their top concern. So we wanted to know more about that to learn what was driving this trend. We found a combination of factors working together to place this concern at the top of almost everyone’s mind. Not only is more hacking technology available, but the mere prevalence of data breaches in the news seems to have people on edge. And of course, in the See-Through Economy, reputation and corporate scandals are closely linked. Take a look at our cybersecurity infographic for more insight into the cyber breaches of the past year and what consumers and companies alike are saying they’ll do about it. 10. Hey, Chipotle, Can You Say Risk Management Rehab? In 2018, we discovered a handful of companies who could benefit from some risk management rehab. These are the companies you’ve heard about in the news not once, but on multiple occasions. Chipotle certainly fits this description. They’ve been struggling to recover from food-borne illness outbreaks since 2015, and it seems they still haven’t understood the root cause of it all. Ineffective risk management. Curious about the trajectory the Mexican grille has taken since that fateful day in 2015? Read this blog for a succinct timeline of events. Well, 2018, that’s a wrap! We hope our readers enjoyed learning with us and have learned some valuable lessons about the world of risk management. If you don’t already, subscribe to our blog and be the first to get expert insights into the latest scandals and greatest tips.